No Bitter Aftertaste: Delicious to the last drop. Our cold-brew system removes most of the acids that make hot-brewed coffee so harsh. So, you get all of the robust flavor & none of the acrid "bite." Stronger, Better Glass: Why settle for tacky plastic? 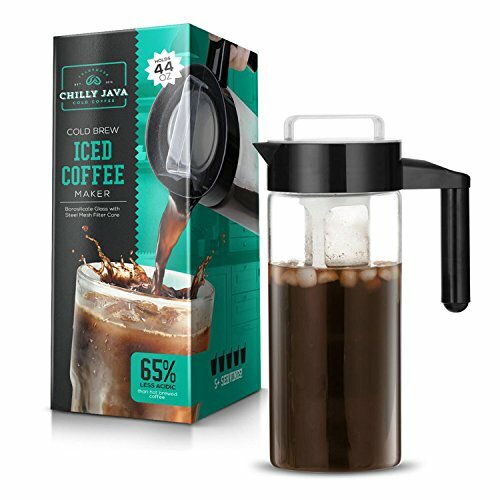 Your Chilly Java pitcher comes in pure borosilicate glass - clearer, classier & much more resistant to thermal shock. BPA-free & nontoxic, too. Keeps Coffee Fresher Longer: Your leakproof, airtight lid seals in flavor for up to 2 weeks. So, you can savor your coffee anytime - hot or cold, fresh & full-bodied. Easier to Clean: Plastic & acrylic can get stained with oil & grime. But your Chilly Java glass pitcher pops right into your dishwasher's top rack & comes out sparkling clean. 100% Satisfaction Guarantee: If you're not thrilled with your Chilly Java coffee pot, send it back to us anytime for a full refund or free replacement - your choice. If you have any questions about this product by Chilly Java, contact us by completing and submitting the form below. If you are looking for a specif part number, please include it with your message.